Dear customers. Please note that our deals are already discounted which is why the prices differ from our printed menu and our online prices. We thank you for your understanding. Shalimar management. Any 8" pizza, portion of chips & can of Pepsi. Any 10" pizza (excludes Indian pizza), portion of chips & can of Pepsi. Any plain curry, pilau rice or plain naan bread & can of Pepsi. onion salad & mint sauce. 2 x starters, 2 main dishes, 2 vegetable side dishes, 2 rice dishes, 2 breads, 2 poppadoms, onion salad & mint sauce. sauce & can of soft drink. Only available on Tuesday, Wednesday & Thursday nights. Starter, main dish, side dish, rice, plain naan, poppadom, onion salad, mint sauce & can of soft drink. Available Sunday - Friday. Starter, main dish, side dish, naan or pilau rice, plain poppadom & mint sauce. A biryani is made with flavoured basmati rice & special spices plus sultanas & cashew nuts. Each biryani dish is served with a medium hot mixed vegetable curry. Cooked with basmati rice, ghee, carrots, mushrooms, accompanied with vegatable masala sauce. Tandoori garlic mains. Fairly hot stir fried dish cooked with a generous proportion of garlic, green chillies, green peppers & onions. Fairly hot. Diced fresh lemons, cooked with chefs special recipe. Very hot curry cooked with fresh green chilli in a hot sour sauce. Rich mild dish containing egg yolk, ground almonds & cream. A distinctive dish with a generous amount of fresh garlic slices with onions, ginger, coriander & special spices. Cooked with fresh spinach, garlic, ginger & a mixture of herbs & spices. Cooked with garden mint, garlic sauce, green chillies & homemade ground spices. Cooked with mild spices, lentils, garlic, garnished with plenty of coriander. Cooked in ghee, with a thick bhuna sauce using ground almonds, peanuts, mango, honey & cream. Minced lamb, cooked in home style curry with onion, garlic, ginger, tomato, garden peas & special spices. Fillet of chicken breast cooked in ghee with mince, spring onions & special bhuna spices. Mixed vegetables cooked with yellow split lentils in a medium bhuna sauce. A hot South Indian curry dish, having a greater proportion of hot spices which lend a fiery taste to its richness. Hot. A very hot dish cooked with extra hot spices. Hotter than a phall, try if you dare! Medium. These dishes are cooked in tomatoes, onions & capsicum. A medium hot dry dish, containing fried onions & tomatoes with green peppers & methi in rogan sauce. A medium curry dish with onions & capsicum. A unique combination of ingredients including sweet peppers, tomatoes & garlic. A medium hot spicy stir fried curry cooked with mixed pickle which gives a tangy taste. Cooked with almond powder, sugar, cream with a mild flavour. A mild curry cooked with a wide range or oriental spices giving a rich flavour. A mild curry dish cooked in special mild spices including almonds, cream & couscous. A mild dish cooked with banana, fresh cream & cashew nuts. Mild. A special mild curry cooked with banana, cream, coconut, pineapple & mixed ground nuts. A spicy hot curry dish which is marinated with fresh ground spices & sauteed with fresh tomatoes, onions, capsicums. A medium hot curry dish cooked with spinach, giving a rich flavour. A hot, sweet & sharp tangy flavoured dish prepared with lentils, pineapple & lemon. A medium hot, sweet & sour lemon flavoured curry dish. Fairly hot stir fried dish cooked with a generous portion of garlic, green peppers & onions. Cooked with a special mixture of spices including garlic, ginger & a strong flavour of fresh coriander. A little hot. A zavisko curry cooked with tomatoes, green peppers, fresh onions, chilli, methi & of medium strength. Cooked with fried onions, tandoori spices & methi. A spicy, dry, medium hot curry dish cooked with fresh green peppers, tomatoes & spices. Basmati rice flavoured with various condiments. Cooked with basmati rice, eggs, carrots & peas. Served with fresh green salad. Any sauce with rice or chips. Onion salad, mint sauce, mango chutney & mixed pickle. Pizza sauce, cheese, tomato & herbs. Onions, peppers, tomatoes & mushrooms. Mushroom, onions, peppers & jalapenos. Pepperoni, mushrooms, peppers & sweetcorn. Salami, mushrooms, onions, peppers & sweetcorn. Spicy mince, pepperoni, onions, jalapenos & peppers. Mince, tomato, green peppers & mushrooms. Mince meat, chicken, salami & onions. Spicy mince, onions, chillies, peppers & sweetcorn. Tandoori chicken tikka, onions, peppers & sweetcorn. Tandoori chicken, mince, onions, peppers, sweetcorn & chillies. Tandoori chicken, pickle, green chilli, pineapple, onions & peppers. Pineapple, tandoori chicken, mango & chilli. Chicken, mushrooms & bbq sauce. Tuna, jalapenos, onions & peppers. Homemade style. Highly recommended! Any curry pizza of your choice. Served on a naan bread with salad & sauce. Donner meat & chicken tikka stir fried with vegetables & a special sauce. Served on a naan. Quick delivery, food always hot, always fantastic taste. Go through website receive 15% discount. Win win. Everything was perfect just what we wanted looking forward to my next visit already. .Order from here at least once a week. .beautiful fluffy rice, .curry perfect and tasty, and plenty of chunky soft chicken .quick delievery. Fantastic deals. I never order from any other takeaway. 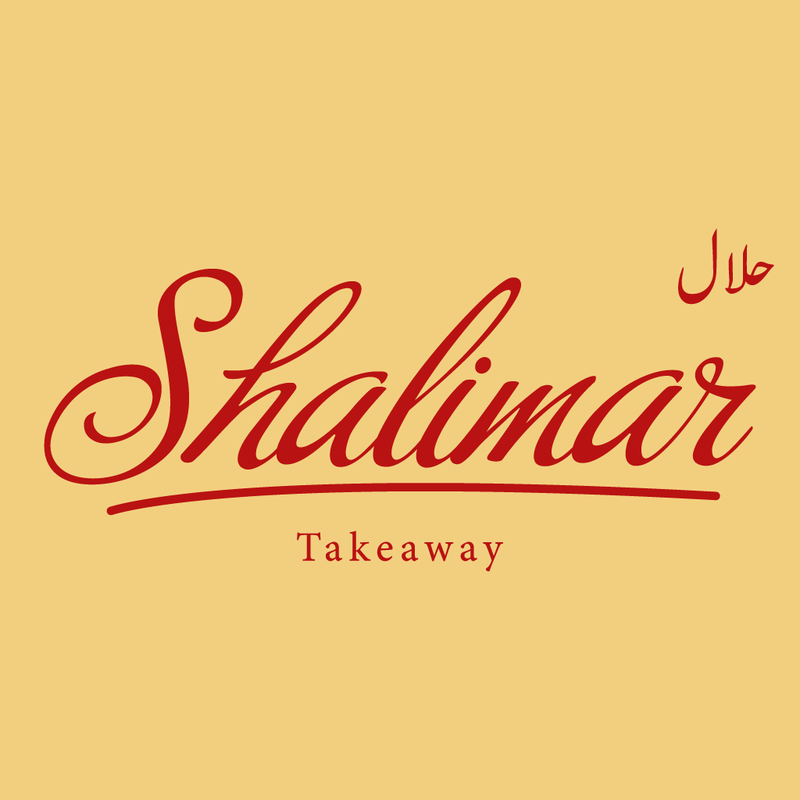 I only ever order from Shalimar. Great tasting food, great price and the food always arrives hot. Already looking forward to my next order. Garlic mayo missing from order. Manager personally brung it himself within 5mins. Good service!